[By Nick] I say it’s time to take a look at one of my favorite Klondike bars. The funny thing is, I’ve been eating Heath Klondike Bars for years but up until a couple of months ago I never actually had a Heath Candy Bar. Sure, I’ve had toffee candy bars mixed into ice cream and all that but I don't think I've ever had the actual candy bar. I was a little taken aback that the candy is actually quite salty. I guess the saltiness is tempered a bit when mixed with ice cream. So with my new found knowledge of what a Heath bar actually tastes like, I think I can now do a proper review of Klondike’s representation of it. Out of the wrapper, it looks kind of like a Krunch Klondike bar. Instead of rice kripsies, this bar mixes real pieces of heath toffee bars into the milk chocolate coating. That’s definitely a swap I can get behind. 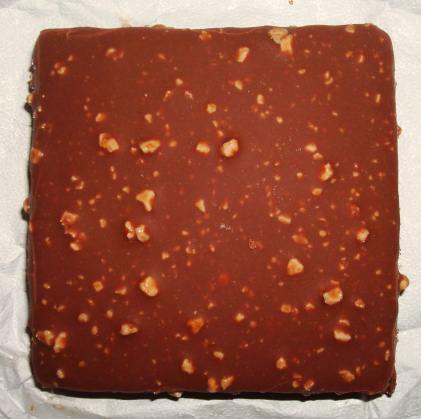 Now I tried multiple times to cut a bar in half to show a cross section but as you can see, the shell seems thinner than your average Klondike bar. I’m not sure if that’s on purpose or not but just something to note. Now you can see that the ice cream is the same color as toffee so Klondike gets an A for presentation and composition of this bar. Looks mean nothing if the product doesn’t taste good though right? Well seeing as in my intro I said this is one of my favorite Klondike bars, you know it must taste good. Now here’s why: The milk chocolate shell, while being thinner than usual still adds a great crunch and that classic Klondike chocolate taste. What really makes this one excel is the toffee ice cream. While it doesn’t quite replicate the flavor of a heath bar, it comes pretty darn close. It’s more sweet than salty but there’s a buttery quality to this that just pulls everything together. You also get some nuttiness from the almonds on the back end. It’s really hard for me to describe the exact flavor of these but just take my word that they’re delicious and addictive. 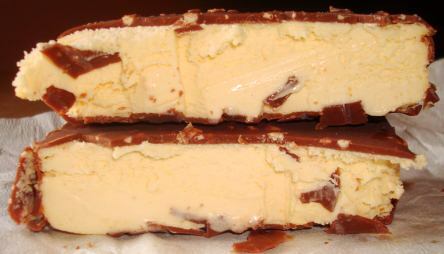 According to Klondike’s website, there are heath bar pieces in the ice cream but I don’t think I’ve ever noticed them. I guess they must be obliterated or something because I tried dissecting the ice cream and I couldn’t find any bits. The official tagline for these on their website is “Kind of like a Heath bar, only ice creamier.” I couldn’t agree more with that statement. These are just one of those novelties that seem to find its way back into my freezer more often than not. If you’re looking for a toffee fix or just a great treat, look no further my friend. This is the only way I'll eat a Heath Anything. My favorite Klondike's are the Caramel Pretzel ones but I haven't seen them around in a while. That might change whenever I get to try the mint chocolate chip ones. Trampus, the caramel pretzel ones are by far my favorite as well. I also have yet to try the mint ones which would be the only variety I haven't tried that klondike offers. I can't imagine them passing caramel pretzel at all though. Hey, I bought some Klondike Heath bars recently; the ice cream is white, not "toffee" colored or flavored, and the coating has very few crunchies. Is this a change or a packaging error? Anon, the ice cream does look white but it is toffee flavored. You might have gotten a bad batch if you couldn't taste it. If you read the ingredients, it should still say heath flavored light ice cream. I love Klondike heath bars my favourite. The only thing i wish it had a thicker shell on th bottom. It's good on the top and sides but you can see ice cream on the bottom, much to thin. SHE here! Very very disappointed I hate when quality goes down but price goes up!! My father in law always kept his Klondike bars semi-hidden out in his garage freezer. When I was over, I'd always sneak out there and see if he had any left over in his stash. They were always great. I hadn't had any in several years as I did not get to visit often. He passed away a few years ago and one day I was thinking about him and those Klondike bars. I just had to have some so I got me two packages. I have to say I was so disappointed. They have definitely cheapened this product over the years. They cost more than other ice cream bars but they were always worth it. I have seen this happen with many products that come out with a better than average product and later in years due to competition, they start cutting costs and cheapening the product. I guess they think we won't notice. Well, I do and it really disappoints. Memories are closely tied to sights, sounds, tastes, and smells. When those things change, we lose a part of those memories. Thanks for listening to my sad ramblings! Unfortunately Klondike is one of those brands that is a shell of it's former self.